Replacing standard tooltips is easy: Just include the script on the page, add a stylesheet, select the elements to tooltip and call the tooltip plugin. This tool has all the features and configuration options you’ll possibly need, such as effect and a plugin framework, scripting API and an event model. A smaller codebase is easier to control and results in snappier behaviour. Without gzipping the size is 3.5 Kb. Clean and semantic HTML. This tooltip does not rely on putting a bunch of crap in the title attribute. The content is defined in its own HTML element. Convention over configuration. The content element is inferred from the name of the target element. Flexible appearance. Since the elements are just plain old HTML, they are styled by using CSS. If you want stems or rounded corners, just give the content element a background image. Flexible content positioning. The position of the content can be customized by specifying one of the built in positions, but if you’re feeling ambitious you can write your own positioning algorithm if you need something more customized. Simple and lightweight. This tooltip doesn’t try to do everything for you, but if you want it to do something you can make it happen. Custom effects. fadeIn and fadeOut (or any other effect) can be achieved by defining the showContent and hideContent callbacks. Tipsy is a jQuery plugin for creating a Facebook-like tooltips effect based on an anchor tag’s title attribute. BeautyTips is a simple-to-use balloon-help style tootip plugin. Any element on the page can be set to show a talk-balloon containing any text or HTML on hover, click, or any bindable event. These balloons are drawn dynamically using the canvas HTML 5 element, and options include corner radius, spike length and width, stroke width. The balloons can auto-position based on the most available area in the current display window or they can be positioned according to an array of preferences (just left or right for instance). To use BetterTip you first have to obtain the jQuery Library. Next you’ll need to Download BetterTip. This download contains a compressed version of BetterTip as well as an uncompressed version. It also contains all the images and a css file. The compressed version with the images and css is 10.4KB and the uncompressed version is 12.4KB. Browsers will automatically display a tooltip when you provide a title attribute. Internet Explorer will also use the alt attribute. But, in this tutorial I’m going to show you how to quickly write a jQuery plugin that will replace the typical browser tooltip with something a little flashier. Position: Complete control over tooltip positions. Round: Configurable rounded corners, no PNG images required. This plugin is yet another product from my development work on Build It With Me. I wanted a sweet & simple custom tooltip, but nothing I found seemed to be smart enough for what I needed. 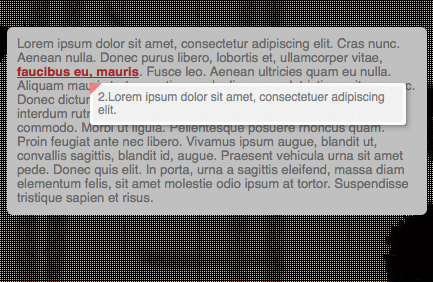 I needed a custom tooltip that behaved just like the browser tooltip, and that is exactly what TipTip does! vTip is designed to quickly provide very lightweight (706b js, 272b CSS, 270b image) tooltips to users of jQuery. The zip includes everything you need (including an example page), as well as jQuery for the examples to work. Using the jQuery framwork any element with a class of vtip will have it’s title attribute turned into a sleek, customizable tooltip without the klunk and loading time of a large tooltip script. What this script does is adds an element to the body when you roll over a certain object. That element’s appearance is predefined with css (positioned absolute and styled) so all we need to do is fill the element with content, calculate mouse position and make it move accordingly. When cursor is moved over he object, element moves with it and when cursor roll out, the element is deleted. With easy HTML that’s how. The set up offers endless configurablity. User your own css and tags (as long as you don’t use the “q” tag anywhere) to style your tab panel. It’s easy to do, easy to set up, easy to style because Tab World does all the hard work. The basic setup is a ul with a specific ID – IT HAS TO BE AN ID – You don’t want two tabs duplicating – If you do… your not so good at this stuff — anyway, then your li tags and then your q tags. IMPORTANT! After that long sentence it is important that you understand, everything not in that q tag will be the tag title, while everything inside of it will be the content. Don’t use q tags in your actual content other than to wrap it because it is a) bad practice anyway and b) it won’t even show up. That may change in later versions but its not a really good idea. — If you know any other Jquery Tooltip plugin then please let me know.